This is the English language edition of the most popular French guidebook to the best boulder groups in the celebrated Fontainebleau climbing area, 50km south of Paris. It is the second edition, with routes and maps updated and revised. The forest of Fontainebleau is a world famous and unique bouldering venue – the sandstone boulders lying scattered over an area of some 1,200 square kilometres, in a unique setting, a wilderness of silver birch, pine trees, beech and oak. This revised guidebook is ideal for all climbers, from beginners to experts – something for everyone. With descriptions of the sites, their circuits and grades, accommodation, child-friendly areas, where to go after rain or in hot weather, this easy to use guide is full of useful and practical advice. To climb circuits at your grade, simply choose a colour that suits your climbing ability: from yellow for beginners to white or black for strong climbers. If you want to climb and bring your children, symbols show the sites best suited for you and your family. Easy to read full-colour maps show the starting point, layout and boulders of interest for each circuit. 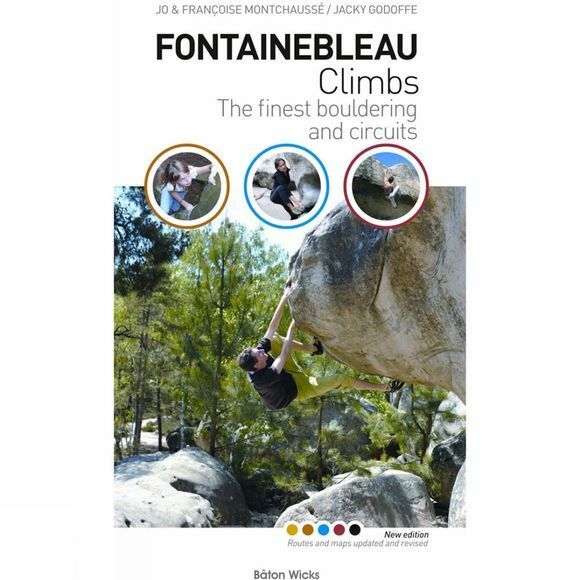 There are over 100 maps, just under 100 circuits and more than 3,000 routes, together with stories and anecdotes on the history of Fontainebleau climbing. Jacky Godoffe has been climbing at Fontainebleau for over 30 years. A professional climber with an international reputation, he is a sports teacher and technical advisor to France's national mountaineering and climbing federation. Jo and Francoise Montchausse were born and live in the heart of the Fontainebleau forest. It was here that they first discovered climbing and have made it their way of life. It remains a source of inspiration for both of them, for their photography and for their products they design specially for bouldering.